The U.S. bank prime rate remained unchanged in January, at 3.25 percent. There was only one change in the credit card offers tracked by this survey during January, which lowered the average rate for consumer non-rewards cards by two basis points. That may seem a subtle change, but the details behind it may hint at a broader trend affecting credit card rates. One of the few remaining credit cards to offer a single rate to all applicants joined the practice of most credit card companies in January and started offering different rate tiers, according to each customer's credit standing. In doing so, this credit card effectively lowered its rate for customers with excellent credit, but raised its rate for customers with weaker credit. This widened the overall spread between the credit card rate for consumers with average credit and those with excellent credit by four basis points. This in turn extends a trend which last year saw that spread widen by 13 basis points. Generally, this trend has meant that the overall average rate for consumer credit cards has risen, while rates for customers with excellent credit have remained virtually unchanged. This suggests that credit card companies are becoming increasingly concerned about credit risk, and some numbers suggest why this might be. On the face of it, this may not seem logical. Consumer bankcard default rates have dropped considerably in recent years, and declined again last year. On the other hand, after bottoming out in 2010, the amount of credit card debt outstanding has increased over the past four years, and the pace of increase accelerated during 2014. Put the two trends together and the picture that emerges is one where consumers are not yet at the point of defaulting on their credit card payments in large numbers, but they are taking on new debt at a rate that puts them on the road towards being overextended. This may be why credit card companies are increasing credit-quality rate spreads. The message for consumers is to compare rates that apply to their specific credit standing, because the difference between that and the best advertised rates may be getting bigger. While the average rate for consumer non-rewards credit cards dropped slightly, the average for rewards credit cards remained unchanged. This widened the spread between the two categories by two basis points to 2.33 percent. 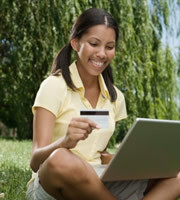 Student credit cards ended January with an average rate of 17.04 percent, which was unchanged from the end of the year. Rates on business credit cards were unchanged in January, with the average for non-rewards cards remaining at 14.89 percent and the average for rewards cards remaining at 15.62 percent. This left the average spread between the two at 73 basis points, which represents the potential added cost of rewards programs for companies which regularly carry a balance on their credit cards. As noted above, the spread between rates for customers with average credit and rates for customers with excellent credit has been widening. Effectively, this means there is a higher price to be paid for having any negative marks on a credit record. Still, it should be noted that customers with less-than-perfect credit histories can avoid paying this price by paying off their credit balances in full every month. Not only does this allow customers to avoid paying interest, but that kind of steady payment pattern could eventually help them qualify for cheaper rate tiers. 0 Responses to "Credit card companies charging more for weaker credit"